Felicity Jones has been a star on the rise in Hollywood since her Academy Award nomination for The Theory of Everything in 2014. Since then, she’s appeared alongside Tom Hanks in Inferno, Liam Neeson and Sigourney Weaver in the upcoming A Monster Calls, and Anthony Hopkins and Ben Kingsley in Collide. But now the young actress takes on her biggest role to date as Jyn Erso in Rogue One: A Star Wars Story. 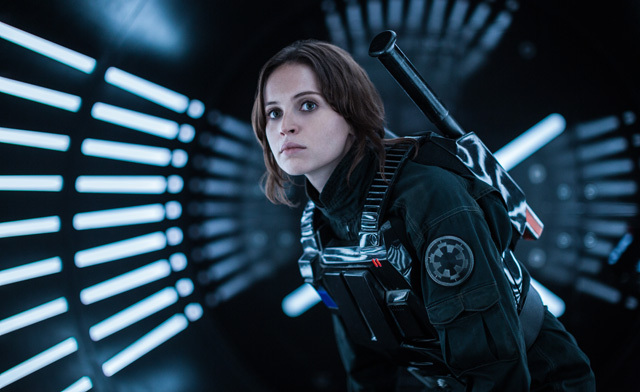 While Jones is petite, elegant, and soft spoken in real life, her character Jyn Erso is anything but that in this Star Wars film. Jyn is tough, rebellious, and haunted by her past as she falls in with the newly-formed Rebellion. ComingSoon.net got to speak with Felicity Jones at the Rogue One press junket and we asked her about the first time she saw A New Hope, what it’s like becoming part of the Star Wars merchandising, and how her character compares with one of the greatest heroines of the saga, Princess Leia. She also revealed that one of her favorite childhood memories was watching Tremors and The Naked Gun on VHS. Watch the video for more!